Climate: North Vietnam has Southern Mediterranean type climate. South Vietnam has a tropical monsoon climate. Credit Cards: Most major hotels and big restaurants in Ho Chi Minh City and Hanoi accept Visa and MasterCard. Tipping: Tipping is not customary in Vietnam, but is appreciated. A 5-10% tip for a meal in a good restaurant may equal a day's wages. Nightlife: There are numerous discos and karaoke bars. As in most places, it is preferable to explore in the company of a long-term resident, to avoid the traditional rip-offs. You are greeted at the airport by our Travel facilitator, and then ushered to a chauffeur driven vehicle. You are then driven to your hotel where you are assisted with your check in. Start your exploration of Vietnam with a city tour of Hanoi. The tour includes Hanoi’s cultural and historical highlights, comprising Lake of Restored Sword, Ngoc Son Temple, the Temple of Literature, the Ethnology Museum (closed on Monday) and a downtown pedicab ride (1 hour) around the old quarters of Hanoi, a collection of narrow streets, each named after the product sold. There is a break for lunch. Afternoon – proceed on a drive to the famous Bat Trang pottery village with a history of 500 years, situated on the left bank of the Red River about 15 km from downtown Hanoi. Observe the artisans forming, painting and glazing their products, which are then baked for several days in huge kilns. Evening - Enjoy a water puppet show, a theatrical genre reflecting the agricultural civilization of thousands of years ago. Check out from your hotel and proceed on a drive to Halong in the morning & board the junk in Halong. Visit Dog island, Incense Urn island, Ga Choi island, Finger island, Hoa Cuong island, Sung Sot cave (“Grotto of Surprise”) and a swim at Titov beach. Balance of the day you are at leisure. 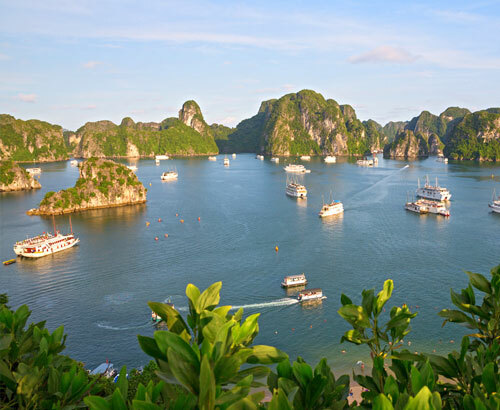 Have a great time until the next morning as you cruise the amazing Ha Long wharf. After breakfast on the junk, paddle by boat to visit Luon cave, Tortoise island, Man's head island, Bai Tu Long bay, Fire island, Bo Nau island, Mat Quy island, fishery village, and Indochina camera. Late afternoon – drive to the airport to board the evening flight to Da Nang. Arrive at Da Nang, transfer to Hoi An and check in to your hotel. In the morning visit the Museum of Cham Sculpture, housing the World’s finest collection of some 300 Cham sculpture exhibits dating from the 7th to the 15th centuries. Then drive some 18 miles to Hoi An Ancient Town, known as Faifo to early Western traders and recognized by UNESCO as a World Cultural Heritage Site in 1999. On arriving in Hoi An, take a walking tour of the ancient town center. Stroll around the Japanese and Chinese Quarters to visit a number of temples, pagodas, communal houses, traditional shops, local markets, and other places of interest. Watch local daily activities, handicraftsmen at work, and a lively show of traditional dancing and music. Afternoon – proceed on a drive to Hue via the Pass of Ocean Clouds and the scenic fishing village of Lang Co or via the 3.9 mile-long Hai Van Tunnel, the longest highway tunnel in Southeast Asia. Start your day with a tour of Hue, a former imperial city of Vietnam ruled by 13 Nguyen dynasties. In the morning, explore the Royal Citadel, built in 1804 on a site chosen in accordance with geomancy. The tour of the Imperial City features Flag Tower, Noon Gate, Nine Dynastic Urns, Nine Holy Cannons, Thai Hoa Palace (Palace of Supreme Harmony), and Forbidden Purple City. Then, pay visits to the elaborate mausoleums of King Tu Duc (ruled 1848 – 1883) and King Khai Dinh (ruled 1916 – 1925). The monuments, designed by the kings themselves, were also used as holiday retreats during their lifetime. Afternoon – Drive to the airport to board the flight to Ho Chi Minh City. Arrive at Ho Chi Minh City and check in to your hotel. Drive 43 miles to Cu Chi, famed for its elaborate network of over 125 miles of three-story underground tunnels hand-dug by local people during the Vietnam War. Crawl down a tunnel to feel the underground life, and then have an option to test your marksmanship with an AK rifle at a local rifle range (extra charges apply). There is a break for lunch. Afternoon – Proceed for a sightseeing tour of Ho Chi Minh City (formerly called Saigon). Visit the History Museum (closed on Monday), the Reunification Palace (the former Presidential Palace), the Central Post Office, then have a short walk along the shopping areas of Dong Khoi Street (former Rue Catinat) from Notre Dame Cathedral to the Municipal Theatre. Drive to bustling Cho Lon (Chinatown). Drop into the lively Binh Tay wholesale market before visiting Thien Hau Temple, dedicated to the Goddess of the Sea. Stop over at a lacquer workshop on the way back to your hotel. Check out from you hotel by noon. Your vehicle and driver are available from 10 am onward to do remaining sightseeing or any last minute shopping – we can make suggestions. Your vehicle and driver stay with you until your late evening assisted check in at the International airport. Our services end at Ho Chi Minh City airport. - Air-con vehicle for transfers and transportation. - porter, and other services unmentioned above.